Light: Weighing options. Comparing prices. Determining the value of one option over another. Juggling resources to make ends meet. Making difficult choices based on what’s best for your body or your bankbook. Looking at the bottom line. Asking for a second opinion on health issues. Shadow: Engaging in endless price comparison. Putting off a buying decision for fear of finding a slightly better value later on. Buying something without regard for value. Breaking your budget with unnecessary expenses. Engaging in behavior with no regard for how your body or bankbook will be impacted. Story: The Main Character weighs the impact his or her course of action will have on everyone involved. Relationships. What does this relationship cost you? If this relationship were an investment, how profitable would it be? This card extends an invitation to consider the pros and cons of your relationship. Before taking action, consider what you have to gain … and what you have to lose. Work. How well do you balance demands of work and life? Remember: you should be working to live, not living to work. If the job is dominating your schedule, press back. If unfettered playtime is ruining your productivity, sober yourself by tallying up the time and money lost to distractions. Spirituality. Of the many options you have for service, which will ultimately do everyone the most good? Identify your skills and talents, and use these as a means of illuminating your own best contribution. Pair your resources with those of other, like-minded people and get twice as much done in half the time. Personal Growth. Be aware of how you determine value. What matters? What doesn’t? Before you can answer these questions, you must have a firm grip on your own value system. Making a choice becomes infinitely easier when you have a firm grip on what you value and why. Fortune Telling. It’s time to balance the budget. Avoid the temptation to spend critical funds on frivolous goods. When? Between December 22nd and 30th. The Juggling Man. 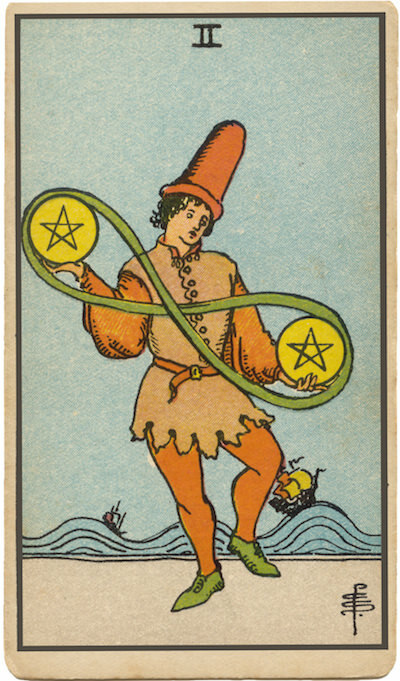 In RWS-inspired decks, a juggler carefully balances two Coins joined by a lemniscate (or “infinity symbol”). The world offers us infinite options; the choices we make are a result of weighing each option against our personal value system. What are your values? What action would they dictate today? Uncertain Seas, Distant Cities. In some versions of this card, we see a rolling, unstable sea in the background—a sign the juggler’s emotions are stirred as he struggles to “get a grip” on his dilemma. In other versions, we see a distant town, suggesting pressure to make a decision that conforms to the expectations of friends, family, and community. Would your decision be easier if you excluded emotional factors? How might your decision differ if you could make it without incurring the disapproval of others? Resource Management. What course of action best suits your long-term goals? In your situation, what happens if you ask for help? What happens if you do what you can do without asking for additional resources? The Marseilles Image. In antique decks, the two Coins on this card are often encircled by a ribbon imprinted with the publisher’s name and the date of publication. How might your decision be impacted by investigating who created this situation … and when? What values govern my decisions? How willing am I to sacrifice a little pleasure now in order to have more pleasure later on? Given my current situation, which course of action will give me more of what I really need?